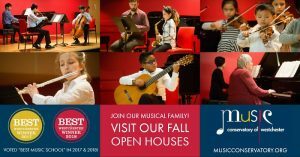 Back to School with the Best Music School in Westchester! The Conservatory is grounded in time-honored musical values with innovative programming for today’s students, including our very youngest. A new elementary group guitar curriculum for students as young as age 4 imparts the musical foundations to pursue more advanced studies in classical, rock, Latin, or jazz guitar, and prepares them to join a variety of bands and ensembles.